Washington, D.C. ~ HealthHIV, in partnership with the National Institutes of Health, National Library of Medicine (NLM), announces the launch of the Go2NLM mobile application. Building on its Navigate to Learn More publication, HealthHIV created the Go2NLM app to provide information about and direct access to NLM’s authoritative HIV-related websites to HIV providers, advocates, and people living with HIV/AIDS. The app features dynamic content, including updates about new and highlighted HIV technical assistance and capacity building tools and resources promoted by NLM. 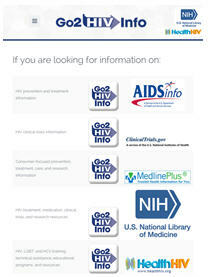 The application may be viewed at www.Go2NLM.org, and within the next two weeks will be available for download from HealthHIV.org, as well as the Apple and Google app stores. For more information about the Go2NLM project, please contact HealthHIV at communications@healthhiv.org or 202.232.6749. HealthHIV is a national non-profit working with organizations, communities, and health care providers to advance effective prevention, care, and support for people living with, or at risk for, HIV and HCV through education and training, technical assistance and capacity building, advocacy, and health services research and evaluation. HealthHIV leads the Pozitively Healthy national HIV consumer coalition, the HealthHCV initiative, and the National Center for Health Care Capacity Building, as well as the National Coalition for LGBT Health.